Some institutions may enable a feature in Canvas called Profiles. Profiles allows you to update your name, preferred contact methods, and any personal links for your account. 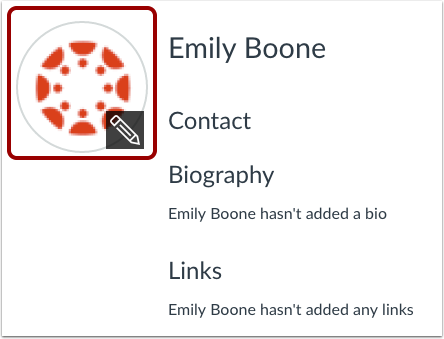 Your profile information can be viewed by all users in your courses. In Global Navigation, click the Account link , then click the Profile link . To upload a profile picture, click the profile picture icon. Note: Profile pictures are a separate permission from profiles. If you do not see a placeholder picture, your institution has not enabled this feature. If you are allowed to change your name, type your name in the name field . Type your title in the title field . If you have connected to any web services, click the checkbox underneath the web service to indicate how you wish to be contacted via that service . To add additional services, click the Manage Registered Services link. Please note that any selected services will not be shared with other course/group members unless you have previously selected the sharing checkbox in the Manage Registered Services page. The Discussion icon  automatically appears as a contact method for Admins so users can contact them through Canvas Conversations. It cannot be selected by any other users. Note: As created in your user profile, email addresses do not appear as a contact method and are only used for Canvas notifications. Canvas users should contact each other via Conversations. Type your biography in the bio field. You can add hobbies and interesting facts about yourself. To add personal links to your profile, such as personal websites, blogs, or portfolios, enter the title of the link in the title field . Type the URL in the URL field . Click the remove icon to delete the link . Click the Add another link button to add another link . Click the Save Profile button. Previous Topic:How do I manage groups as a student group leader? Next Topic:How do I add a profile picture in my user account as a student? 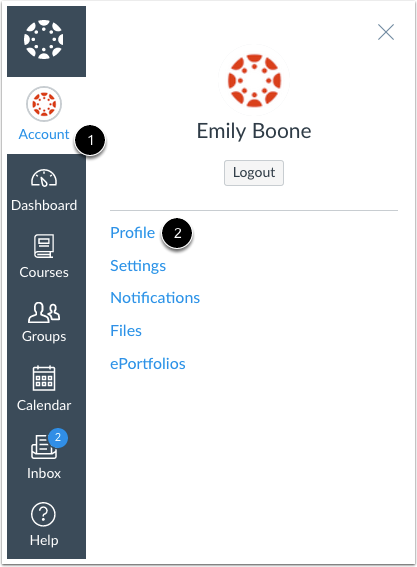 Table of Contents > Profile and User Settings > How do I edit my profile in my user account as a student? I wonder if you're looking for this guide: How do I connect to web services outside of Canvas as a student? Let us know if that's what you were looking for and let us know if you have any other questions. I know it's only been a few days since Nathan replied to your question. I wanted to follow up to see whether you had any further questions for us. If there's anything more we can help with, please let us know. In the meantime, if we don't hear from you or if you let us know that your question's been answered, we'll go ahead and mark this comment thread for archival. We periodically remove comments from the Canvas guides to keep them updated and tidy. We're always happy to help, though, so please reach out if you have any further questions about Canvas.